This is the Rabbit Sampler from the Garden Verses leaflet & I think it turned out so cute. I used all but 2 strands about 6" long of an entire skein of green DMC floss.... unreal huh? Doesn't look like it would take that much floss, but it did. It's worth it though cause I think it's just adorable! It's stitched on 32 ct Light Examplar by Lakeside Linens with DMC floss. Thanks for stopping by & happy stitching! That is beautiful!! Congrats on your finish! Wow, this is a really beautiful finish, congratulations! I love the design...very pretty finish. Congratulations on a splendid finish. I just love that little snail on the side. It is really pretty. Nice work! Absolutely beautiful. You did good girl! Congratulations Amy, it's beautiful. Love that snail, sun and the moon. Very pretty! I just love it Amy. Isn't it amazing how much you can use of one color in PS designs? I am working on several on my big piece and have gone through quite a lot of green. That is gorgeous. I love the colours! Wonderful Amy! It's a perfect project for this time of year and you've stitched it beautifully. Amy!!! That is gorgeous!!! 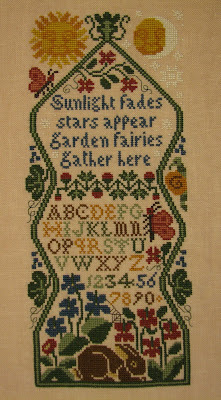 I have to see if I have this in my stash - don't think I've ever seen this one stitched and it's now on my "Must Do" list. Fantastic!! Wow, great finish Amy! It's so pretty!! Oh so beautiful! Congratulations on finishing it. Gorgeous!!!! Congrats on the wonderful finish, you done beautiful work! Very nice, Amy - beautiful finish! This is so nice! I have this book but never realized how beautifully these finish up. Congratulations on a breautiful finish! This is just wonderful! I wish that Garden Verses leaflet wasn't OOP! Believe it or not, I love PS and don't own any of their designs! Shame on me! What a beautiful finish. I absolutely LOVE Prairie Schooler and unfortunately this is one pattern that I do not own (yet). Great job. A great finish Amy. So bright and uplifting. Wahoo - beautiful! And lucky you having the elusive Garden Samplers pattern. :) Congrats! I have been stitching for almost 40 years and I truly love stitching & all that goes along with it. I also love to sew & to collect fabrics. I have been married to Ray for 26+ years and he doesn't mind my obsession at all, thank goodness!